Native American beading crafts make great projects for children and adults alike. They not only give you an outlet to get creative or to de-stress, but they also give you a great opportunity to reflect on American history and Native American culture. Furthermore, Native American beading crafts produce beautiful final projects that you can enjoy for years to come. There are several different types of Native American beading crafts that you can do, depending on your skill level and the type of craft project you want to make. Native American sun catchers are charming, tribal-inspired accessories that can be placed on a vanity or in rear view mirror, used as a purse zipper, or hung around the house as a piece of unique décor. To make your sun catcher, first cut out the center of your craft foam or plastic coffee lid to form a circle. Wrap a piece of ribbon around the circle until it is completely covered. Glue both ends of the ribbon for easy handling. Take a piece of thin wire or beading thread, and use it to create a loose loop around the circle, going around six to eight times. Bring the thread or wire around and weave it through each of the loops while slightly pulling it to form a web-like pattern.Hold a bead in its center and pass the thread or wire through each bead each time you go through a loop. You can insert beads at any point within the pattern by simply holding the bead and then looping through it while you create the loops. When you've finished looping, take each end of the thread, and let it hang down like fringe from the bottom center of the circle. Attach more beads at the ends off the fringe, and secure them with knots. Many types of beads are used in Native American designs, including pipe, round, chip, and tube shapes. Pick the beads that strike your fancy, but for an authentic Indian design, stick to materials and colors that reflect nature. Some examples of items used in Native American bead neckles include seeds, stone beads, shells, hemp cords, leather cords, and corn. Select the heaviest cord to use in passing through the beads, such as cords made from nylon, silk, nylon-coated wire, or elastic thread. Before starting to craft the necklace, pre-stretch your cord. Create the beaded Indian necklace by first stringing the beads on the cord; this is the simplest design. If you want something more complicated, there are plenty of other options as well. Designs and styles for necklace-making are as diverse as the native tribes that make them. For a sun catcher or dream catcher-inspired necklace, create or buy a beaded hoop. The beaded hoop is strung on a chain consisting of eye pins that have been covered in beads. Attach the eye pins to the hoop to create a stiff frame that can sit flat on your chest. The top layer of the eye pin chain is constructed by running a cord through it to form the neck, which is strung with more decorative beads and finished off with a clasp. To create a bracelet with porcupine quills and beading, create holes in the quills using an awl. 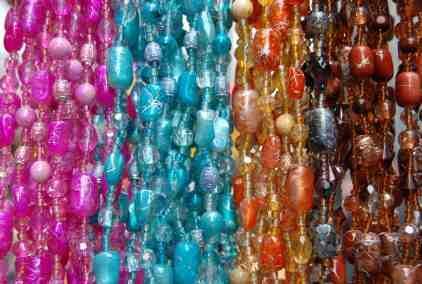 Thread them onto the cord with decorative beads. The quills are very fragile, so you should use spacers between the quills and the beads. Similar to the necklace, finish off your bracelet with bead tips and a clasp. Your choice for the perfect Native American-inspired craft will depend on your skill level and style. Regardless of whether you want something to decorate your home or something to wear to jazz up an outfit, a Native American-inspired craft can provide just the solution.